Source: Wikipedia, WarioWare: Twisted! , available under the CC-BY-SA License. WarioWare: Twisted!, known in Japan as Mawaru Made in Wario (まわる メイドインワリオ) is a video game for Game Boy Advance by Nintendo. The game is of a variety and puzzle genre. It was not released in Europe, despite having been announced for release there. In the game, Wario and his friend Dr. Crygor invent a Game Boy Advance that only reacts when tilted around. The game follows the WarioWare formula with a variety of games that lasts for only a few seconds. 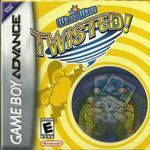 The cartridge utilizes a gyro sensor and players must spin and twist in order to play the games.The WarioWare: Twisted! cartridge has a built-in gyro sensor and rumble feature (for feedback during rotation). Most of the microgames are played by rotating the entire handheld device.